Here in Wichita Falls Texas you will find a place on California street that almost everyone in the area has heard of. It’s official name is the White Sanitarium, but most call it the Old Insane Asylum. The White Sanitarium opened in 1926 under the direction of Frank S. White, a man who had been superintendent at the state asylum in Austin before the turn of the century. He first advocated providing a non-institutionalized lifestyle for his patients to diminish the effects of the asylum itself on their sanity. It was abandoned sometime in the 50’s after being severely damaged by a flood and sat empty for over 50 years. Many a young folk, as well as old folk have either been there to visit it or have heard of it, as it is supposedly haunted by spirits that possibly died there. There were radical medical procedures that took place there long ago, and some people were said to have died from those procedures, and now roam the place. People have reported seeing lights on at night time when there was no electricity to the place. There have been stories about seeing a woman in white walking the grounds, and also looking out the windows. One of the most noted are people claiming they see a group of men sitting around table at night time playing cards. There was a recreation room at one time and they did play cards there long ago. It has been said that voices of children have been heard there. 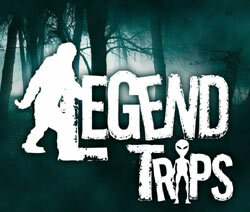 After seeking permission, myself along with my legend tripping team mates as well as a TV reporter went in search of finding out about the claims ourselves. It was quite an experience. The place had been purchased and had been remodeled, but still had the main structurere as it was. It was empty. We were excited and had some equipment to record what we found. First thing that happened was the TV reporters camera lost all power and two other cameras and voice recorders lost power just minutes after we got started, so we did not have the tv camera to record anything because he had not brought a backup battery. It is theorized that when spirits are present, that sometimes they look for any energy they can find and many times it will be from cameras, flashlights and other devices. We spent several hours there trying to capture pictures and do evp and just absorb the experience. There were several members who felt cold air rush by them, and while we were doing some evp, we all actually heard a small child talking upstairs. The TV reporter who was a total skeptic heard it as well and several went to check it out. No children. After several hours of taking pictures and doing evp and having several unexplained feelings like being watched, chills to the bone, distinct heaviness at times, we decided to call it a night. We thoroughly enjoyed it. Next day after listening to the recordings we did, we did pick up several children’s voices as well as several adults voices talking and something that sounded like a bicycle horn like those red bulb ones you use to see on bicycles many many years ago. What an adventure it was.